Mortal Kombat II, called Mortal Kombat II: Kyuukyoku Shinken (モータルコンバットII 究極神拳) in Japan, is the sequel to the critically acclaimed Mortal Kombat. It was originally released in 1993 as an arcade game before being ported to numerous platforms. It is considered by many to be the best fighter of the series. It sports a cast of twelve characters with numerous special moves including new finishers and new kinds of finishers. It's the last game of the series to be officially released in Japan. The game plays almost identically to its prequel, Mortal Kombat. The game consists of fourteen fights that start against the other characters of the game, before moving onto one of two secret characters if certain conditions are met. From there, the player battles the monstrous Kintaro before fighting the game's final boss, Shao Kahn. Controls are still the same as the first game. With a standard control pad, using the D-Pad moves your character, is for low punch, pressing either with or does a high punch, and are for low and high kicks respectively, and blocks. With a Six-Button Control Pad is for low punch, is for high punch, is low kick, is high kick, and or blocks. All characters share the same basic range of attacks, such as uppercuts, foot sweeps, and throws, although these moves vary in speed and power from character and character. When using a three button controller, not all of these moves will be available. What differentiates each character are several special moves that are performed by entering certain button combinations. Fatalities can be performed like in the original game, and each character now has two of each. Two other kinds of finishing moves appeared in this game, Friendships, where instead of the winning character killing off the opponent, they would do something friendly, and Babalities, where the surviving character would transform the loser into an infant. These were put into the original arcade version of the game to poke fun at those who felt the original Mortal Kombat was too violent. Unlike the Genesis version of its prequel, the game is completely uncensored from the start and no code is needed to uncensor the game. The Mega Drive version was developed by Probe Entertainment. Differences from the Arcade version include a limited color palette, reduced voice samples, and original game music. Gameplay speed is slightly increased. In the place of Goro's Lair is a slightly modified portal stage, which replaces the reds and oranges with blue. The game endings have also been reduced to text which scrolls across the screen as the winning player poses in Shao Kahns Arena. There are some easter eggs that are exclusive to this version such as the "Oooh Nasty" debug option which replaces the Dan Forden Toasty image with a kids drawing and gives Raiden a "Fergality" special move. Mortal Kombat II (known as Mortal Kombat II: Kyuukyoku Shinken in Japan) was ported to the 32X by Probe Entertainment, the same company behind the Mega Drive version of the same game. The original port was first released in the United States on December 4, 1994 in time for the Christmas season. A revision fixing minor programming issues and bugs that were most likely not addressed due to the Christmas deadline was released in January 1995. The game was released in Europe and Japan in 1995. This port is built off of the Mega Drive version, and much of the game still relies on the Mega Drive hardware, with most of the backgrounds and menu graphics being rendered by the 16-bit hardware. The 32X side is used to give character sprites more colours and render more advanced shadows, which in turn frees up some more palette entries for the backgrounds on the Mega Drive side. The 32X version enhances the sound effects to bring them more in-line with the arcade version, and adds many voice clips that were missing in its Mega Drive counterpart, namely Shao Kahn's announcing of the rounds and various screaming noises. Due to the game's tight release schedule, however, it retains the Mega Drive version's soundtrack. The port received many lukewarm reviews due to its inferior soundtrack, but is preferred by some over the SNES version for it's tight controls. Like other Sega Console versions, it was developed by Probe Entertainment. The Game Gear and Master System versions are identical aside from the screen size. Eight characters and Shao Kahn are present but several were removed such as Raiden, Baraka, Johnny Cage, Kung Lao, Noob Saibot, and Kintaro. Several levels are also missing and the only level with a stage fatality is the Kombat Tomb. Each character has one fatality removed along with friendships. As expected, the graphics and sound take a hit and voice samples are nonexistent. Virtually all the graphics are rendered through the use of background tiles rather than sprites, leading to a choppier (if less flickery) appearance than its rivals. This port is essentially an enhanced version of the Probe Entertainment-developed PlayStation port. Improvements from the PlayStation port include slightly better load times, and the ability to pre-load morphs for Shang Tsung (much like Mortal Kombat Trilogy). Unlike the PlayStation port, however, there is no option to enable Shao Kahn's dialogue (such as his announcing of the rounds). Kitana's death screams are also missing. Both of these ports, however, have been received negatively by many gamers. They're widely considered to be inferior to the 16-bit ports for their lack of certain sound effects, poor load times, and occasional slowdown. The Saturn version was also released almost 2.5 years after the original arcade version, so many found there to be no excuse for these issues. 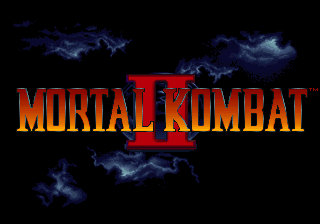 Main article: Mortal Kombat II/Comparisons. Thanks again Stacy. We'll miss you!! Main article: Mortal Kombat II/Magazine articles. Main article: Mortal Kombat II/Promotional material.